Ok, I've been promising this post about cake pops for a while now. Here goes. I finally tried out the culinary craze known as the cake pop for July 4th. I have to tell you, before we get to how cute they are, they taste SO GOOD. No one ever talks about how yummy they are so I thought I would get that out of the way right here. Cake + frosting + candy coating = deliciousness. This may surprise people, since I like to bake, but I love the process of baking so much more than the eating of the sweet things. Many times, I only have one test cupcake or cookie and I don’t eat any more of what I bake. 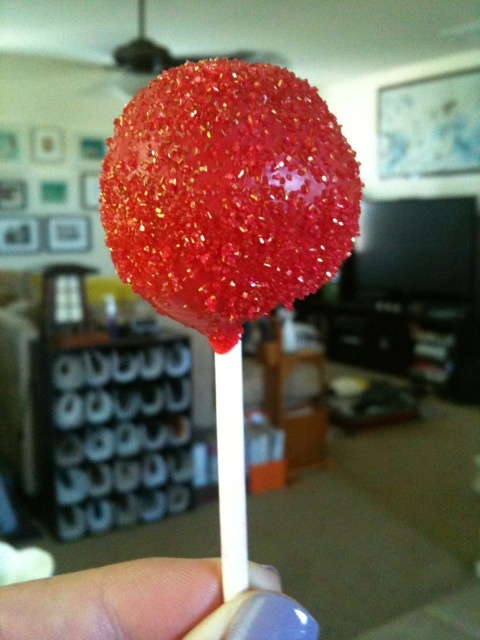 Cake pops are the perfect amount of sweet for me, though. Less of a commitment than a cupcake or a slice of cake, plus they are fun to eat! It’s win-win-win. I will direct you over to the Queen of the Cake Pop, Bakerella, for the full recipe and techniques, but I have a few tips. Bakerella has been perfecting this craft over the years so some of her older blog posts don’t have all the tips and tricks she has discovered along the way. I read through all her cake pop posts, and I have distilled the most helpful tips here, plus a few things I figured out in my experimentation. 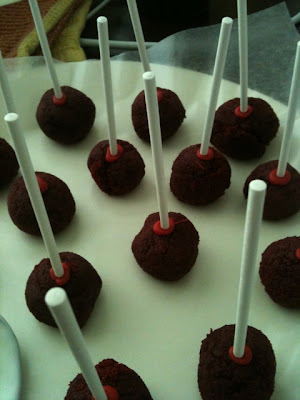 1) After you form the cake balls, put them in the freezer for 15 min, then transfer to the fridge. 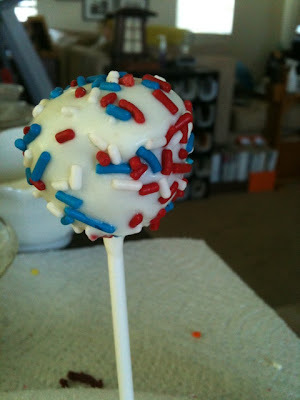 2) When placing the lollipop stick, dunk it in the candy coating first, then spear the cakeball. Do a batch of these and let them set for a few minutes (in the freezer works extra well). 3) Letting the stick set gives your candy coating time to cool off for a few minutes (4-5). This seems to be essential for having it coat properly. 4) When dipping the pop in the coating do not do anything your instincts will tell you to do – do not twist the stick, do not stir, do not hold the pop in the coating. I learned all these lessons the hard way. Just dip in one motion. Make sure you are using a small measuring cup or something that will allow you to dip the pop in and out and fully submerge it under the coating. 5) After dipping, patiently let all of the excess coating drip back into the cup. This may take a while, but you will save yourself a big mess when decorating. 6) Use Wilton brand melts. I don’t mean to do a plug, but I used two different brands and the Wilton was far superior. Plus, they are readily available at craft stores. 7) It will look like the cake balls you are forming are too small (compared to the pictures on Bakerella’s site). No worries, when you dip it in coating, the pop appears much larger. 8) Use box mix and canned frosting. It will save you so much hassle since the pops are labor intensive anyway. It still tastes good! 9) Remember to have a Styrofoam block on hand to use as a drying rack. I used a Styrofoam wreath form left over from Christmas that worked really well. I loved the cake pops! They were delicious. I ate way too many. These look amazing Jen! I'm totally going to have to try them, after busy season that is! I WONDERED how they made these things! Thanks for the tips and see you in BYW class!